This is yet another study of a famous dictator by the brilliant director of Russian Ark, so I'm expecting the praise that's been heaped upon the film over the years to be warranted. It�s not much of a stretch to say that the biopic has been done to death in recent years, but it�s always great when a director puts an original touch on this clich�d subgenre. One such director is Aleksandr Sokurov, the man behind the amazing Russian Ark, and the first two films in his tetralogy: Molokh and Taurus. 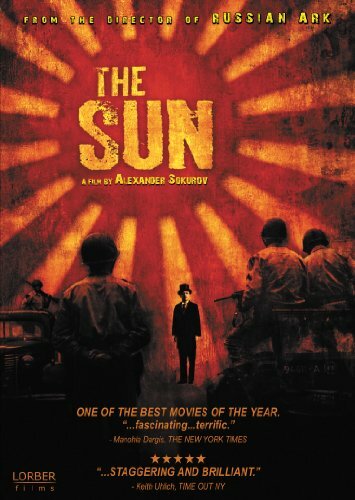 The third film in his tetrology is 2005�s The Sun, which chronicles Japanese Emperor Hirohito and the aftermath of Japan�s defeat in World War II. Sure, it sounds like a straight-forward biopic at the basest of levels, but thanks to Sokurov�s unique vision and an amazing performance by the lead, The Sun more than stands out among a crowded field of similar fare. Japanese Emperor Hirohito (Issei Ogata) is living his post-World War II defeat days out in his palace, once a hot bed of military activity. Now, it�s been relegated to a nearly-empty shell of a mansion, with only the Emperor and a handful of servants remaining. Hirohito begins to sense that the end of his reign is imminent when U.S. troops arrive and place him under house arrest. They mock him, saying he is the spitting image of Charlie Chaplin, and transport him to a series of meetings with General MacArthur (Robert Dawson). Together they attempt to construct a plan that involves a transfer of power and a means to make the Emperor seem at least somewhat sympathetic, despite his actions during the War. The manner in which Sokurov structures his film is engaging from the start, despite a rather slow pace to the proceedings. While some audiences might be turned off by such a languid flow, hopefully most will find it breathtakingly original. We open with a look at Hirohito�s morning routine, from waking to tackling his newfound hobby, marine biology. This taps into things that we might never have thought of in such material, as biopics generally concern themselves with the facts of a war or historical figures life, while Sokurov goes an extra step and shows us that these people had to do something to occupy their time when they weren�t in the heat of battle or contributing to modern day text books. A huge part of the film�s effectiveness is the award-worthy performance by Issei Ogata as Hirohito. He�s simply mesmerizing to watch, embodying every minute detail of the Emperor�s physical appearance, from his odd teeth to the strange way his mouth moves when he speaks. Ogata portrays Hirohito�s strange mouth (which almost moves like a fish�s at times) in a way that could have easily been a major distraction, but instead only enhances the compelling oddness of this historical figure. Thanks to Ogata, we feel the internal emotional struggles Hirohito endures, but at the same time, we�re never sure if he�s entirely right in the head. This is a truly dynamic performance that has gone criminally unnoticed until (hopefully) now. I�m really not sure why it took five years for The Sun to make it to DVD, but, thanks to Lorber Films, it�s finally available. Unfortunately, the video quality is far from perfect, and, at times, even difficult to watch. This has everything to do with a shoddy transfer, and nothing to do with the style and method that Sokurov shot the film in, however. He used a digital camera to shoot the film himself, adding to the realistic feel of the film. Unfortunately, the transfer suffers from far too many digital artifacts and a ton of compression issues, which drag it down far too often. The audio fares much better than the video, with the eerie, atmospheric soundtrack adding to the dark mood of the film. A couple of throw-away extras add to the disappointing quality of the DVD, but just having the opportunity to finally watch The Sun is a welcome thing, indeed.